This page has ben prepared in reponse to several correspondents offering to submit board details and or images. While my requiements may seem extreme, the objective is to present maximum material in a regular format. If this seems like a lot of work, it is. My work load will be substantially reduced if emailed submissions conform to my requirements. 3. Download this page to your hard drive, check you have the images. 4. Print this ( 6 ) pages, use black and white/economy, images may not appear. 5. Use print out for reference and the back for your notations and calculations. 7. Select a catologue entry that approximates your board by design or manufacturer, and download. 8. In Netscape Communicator, select : File. Select : Edit Page. Opens Netscape Composer. 9. In Netscape Composer, highlight and update data from your notes, insert images and and save changes. 2. Use this number as the filename for your catalogue entry and with an extension for the associated images, see Scans. 1. Carefully inspect board for areas of damage. 2. Clean wax from deck, and any deposits on the bottom, with a wax comb. 3. Clean board with rags and ... acetone/alchol/spirit/WD 40/warm water and detergent, other. 4. Rinse with clean water and dry wih rags. 1. Use a SLR or digital camera - a pocket camera will be able not to shoot decals or fins. 2. Do not use a flash - it will just put a glow spot on the board. 3. Try to pick a spot outdoors but not in direct sunlight. 4. Ideally background should be plain/uncluttered and in contrast to the board colour. 5. Personally, I set the camera on auto exposure (appeture and shutter speed), no flash, manual focus. And try to hold it as steady as possible. 1. Stand the board securely upright, if possible put a block under the tail. 2. Use a tripod (I don't) and use a detail, for example the decal, to sharpen focus. 3. Aim the camera at the centre of the board to minimize template distortion. 4. Try to fill frame, nose to tail, but without cutting off either. 5. Shoot both deck and bottom. 1. Use a tripod (I don't), the camera aimed at the centre of the image to minimize distortion. 2. Shoot as close as possible, with the sharpest focus. It is usually difficult to fill the frame. 3. Shoot all relevant decals. 1. Best shot is at about 33 degrees, showing the tail. 2. Alternative is the more accurate profile shot, but this is less informative, particually for multi fins. Note this is a new scaling format as of June 2002, see entry #100. - select oversized image, complete scan. - digitally manipulate image, eg Rotate, Clarify, Enhancement, Sharpness. - select oversized image, specify board length as 26 cm, complete scan. - finely crop image, specify board length as 25 cm. - calculate length to scale at a ratio of 1 foot = 2 cm. For example six foot 0 inches = 12cm. See Scaling Table. - select oversized image, specify board length as over-estimated scaled length in cm, complete scan. - finely crop image, specify board length to scale in cm. - save as JEPG file, with file names like 380.jpg for the deck and 380b.jpg for the bottom. - select oversized image, specify image width as 8 or 10 cm, complete scan. - finely crop image, specify image width as 8 cm. - save as JEPG file, with a file name like 380d.jpg For more than one decal, file as 380d2.jpg etc. - select oversized image, specify image width as 10 cm, complete scan. - finely crop image, specify image width as 8 or 10 cm. - select oversized image, specify image width as 12 cm, complete scan. - finely crop image, specify image width as 10 cm. Note : Any of the manufacturing details on the board could be misleading. SHAPER - sometimes indicated by decal or markings on the blank, but these can be the most misleading. DESIGN - the approximated general design, for example Twin Fin II, or in rare examples, a model name. 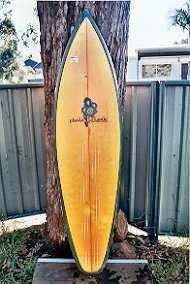 DESIGNER - the shaper/surfer most associated with the design, for example Mark Richards. 2. Note number, width and possible composition of stringers. 3. Fibreglassing - note rail cuts, tinting, pigments, spray, resin pinlines, finbox/plugs, leg rope plugs. stress marks - usually acrcoss the bottom/centre of the board. delamination - decals and foot/knee wells. non original fin - blank damage from loss of original fin. Measure along the bottom of the board, nose to tail. 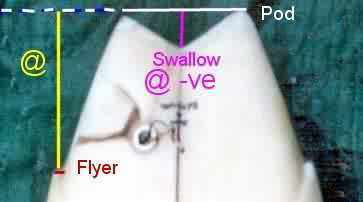 - split tails (eg swallow tail) are estimated at their extremity. Measure along the deck of the board, nose to tail. - strecth tape to measure as a straight edge. A surfboard has two lenghts. Most measurements appear to refer to the bottom, possibly because it is usually shaped first. Technically the straight edge deck length is probably the most consistant indicator. Variation in length measurement is indicated in the rocker/thickness image below. Divide the bottom length by 2, measure from the nose. Mark on the bottom stringer with a marker pen or a bit of adhesive tape. Measure the widest part of the board. Mark on the bottom centre line with a marker pen or a bit of adhesive tape. - adjust the tape over about a 6 inch range to confirm the widest point. Measure the difference between the Mid-point and the Width markings on the centre line. - if the widest point is at the Mid point, then the Wide point is 0 inches. - if the if the widest point is behind the Mid point (towards the tail) , then the Wide point is negative inches. eg - 6 inches. This is the case in the example above. Measure 12 inches from the nose of the board. Measure the width at this point. Measure 12 inches from the tail of the board. - often the fin/s make this difficult and this meaurement is easier to do on the deck. - for split or diamond tails measure beween the two extremities and positive or negative depth of variation. Measure from tail, see Pod image above. - difficult to measure by eye with the tape against the rail, usually you underestimate. - ideally measure with calipers. - or use 2 straight edges across the board (deck and bottom) and measure the gap. 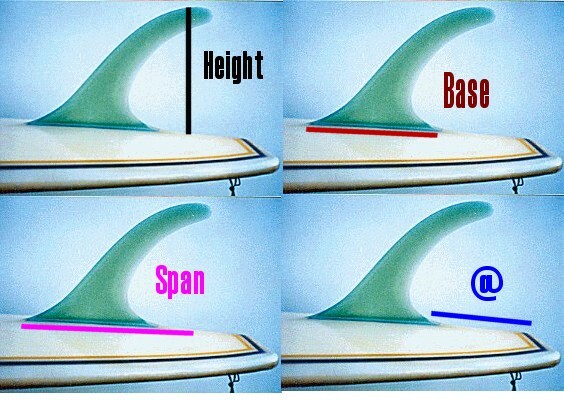 Measure height from board to top extremity of the fin. 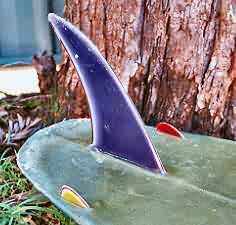 Measure distance from front of base to a point on the bottom that aligns with the fin tip. the Span. These may indicate Place of manufacture, Shaper, Glasser. Most manufacturers redesign their labels, sometimes with only minor variations. These can be useful to date the board. 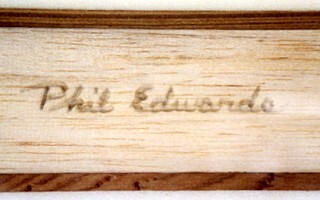 A decal reading Designed by John Smith usually indicates that the board was not shaped by John Smith. Some decals can be trimmed by the glasser resulting in an unusual re-design. Decals are often subject to delamination off the blank. Carefully examine the board and note any markings on the blank, usually down the stringer in pencil. Some later boards may be annotated on the glass with a marker pen. These markings are often inconsequential, but occassionally give the date of construction. If the markings indicate dimensions, it is possible that these are incorrect. Wax alternatives, eg adhesive grip pads. Details of board purchase, riders, repairs. These may be cleaned from documentation, oral report or estimation. The board in context of general design history. An subjective sliding scale to cross reference with the image quality. Geoff Cater (1999-2014) : Appendix : Catalogue Specifications.